The IIT College of Science not only prepares you to excel in your chosen discipline or professional area, but also provides you with awareness of the needs and complexities of the modern world. We prepare you for the opportunities that will be presented to you as you go out in the world. We prepare you to make intuitive leaps forward and seize opportunities. As Louis Pasteur, the great French scientist and humanitarian, said, "Fortune favors only the prepared mind." 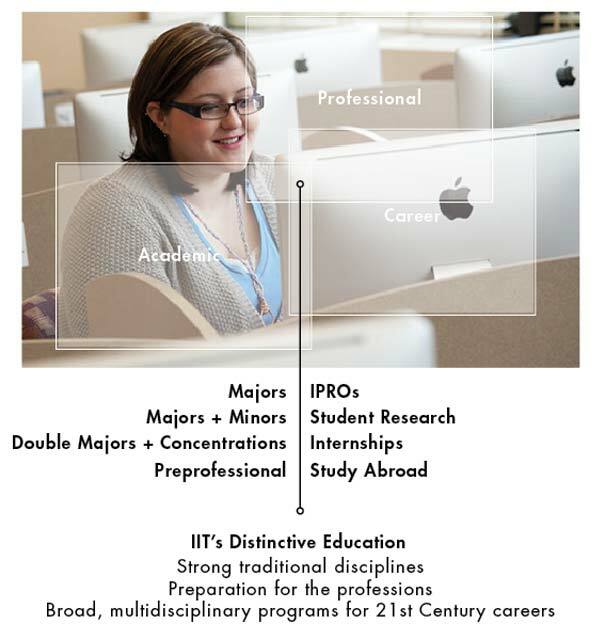 CoS plays a key role in creating the distinctive IIT graduate. A CoS education combines expertise equivalent with that at the very best private technological universities, with exposure to the knowledge and mindsets of the broad range of disciplines and professions at IIT. Offers the advantages of a small, elite private college with major university research. Offers greater flexibility in programs, cross-disciplinary and multidisciplinary opportunities, and learning experiences outside of the traditional classroom. Promotes excellent grounding in one's discipline with an understanding of others' disciplines and perspectives. Has strong emphasis on research and scholarship, even for undergraduates, to help you gain early experience with inquiry, knowledge creation, and self-directed learning.